Oslo, Norway (CNN) -- The numbers tell a small part of the story: Eight dead in a bomb blast. The names that police have released so far reveal a little more. Anne Lise Holter, 51. Tove Ashill Knutsen, 56. Hanna M. Orvik Endresen, 61. Kai Hauge, 32. But a 16-minute video shot in the immediate aftermath of the explosion in Oslo, Norway, brings home the horror of what happened there on July 22 in a completely different way. It's not so much the sight of papers fluttering out of the shattered windows of office buildings, or even the red cables sticking out of the ripped concrete pavement. The whimpering of a woman near tears moments after the bomb blast. The constant crunch of broken glass underfoot. The urgency in the voices of passersby trying to help the wounded. The insistent alarm bell ringing a three-second warning, pausing as if for breath, and ringing again. And again. And again. And again. And again. And finally, the siren of a single ambulance, long after the explosion that smashed Norway's calm. The video was shot by Johan Christian Tandberg, who was driving through a tunnel under the government building that was the target of the attack when the bomb went off. Authorities have charged Anders Behring Breivik, an apparent right-wing extremist with a hatred of Muslims and multi-culturalism, with setting off the bomb. He's also charged in the shooting deaths of 68 people at a Labour Party youth camp on Utoya island, where he eventually surrendered to police. His lawyer says he admits carrying out the attacks. People all over Norway sat in front of their televisions and cried when they heard the next day how many people had died, and they are still crying, Tandberg told CNN Thursday. What he saw when he came out of the tunnel last week "looked like a war zone," he said, adding that he immediately thought of the September 11, 2001, terror attacks in the United States. He grabbed a camera and started filming on the spot. 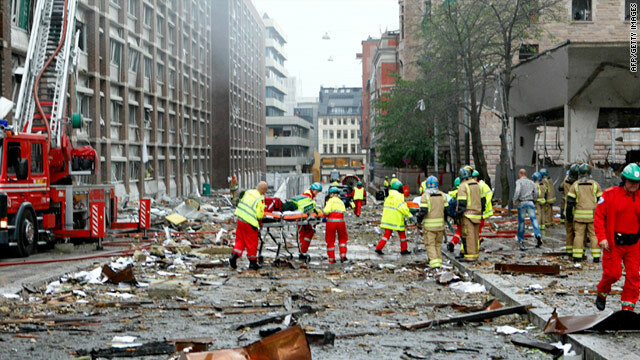 The resulting video shows central Oslo littered with street signs ripped out of the ground by the blast, insulation torn from buildings, and people wandering in shock. He follows a man though a damaged building, looking for wounded people but finding only offices in complete disarray, furniture tossed around and ceiling panels hanging down. Back on the streets, at least one person is seen with a cut on his leg, and several people cluster around another casualty. All the faces in the video are blurred. An emergency services worker makes an urgent-sounding call into a radio. Smoke rises over a building in the near distance. Tree branches litter the ground. A woman weeps. And the alarm bell rings. And rings. And rings.